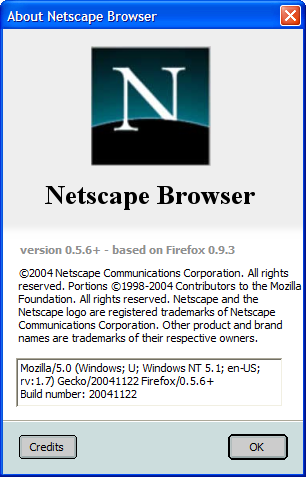 The Netscape Browser prototype is based on Mozilla Firefox 0.9.3. Netscape are very careful to use the term 'prototype' as opposed to 'beta' but the FAQ for the release suggests that they anticipate a shipping product based on the technology to launch in 2005. On Windows XP (the prototype is available for Windows 98, ME, NT4, 2000 and XP), the user-agent string is 'Mozilla/5.0 (Windows; U; Windows NT 5.1; en-US; rv:1.7) Gecko/20041122 Firefox/0.5.6+'. We're not sure where they got the '0.5.6+' from or why 'Netscape' isn't included. The installer is a pretty standard affair based on the Nullsoft Scriptable Install System. By default the browser installs to C:\Program Files\Netscape\Netscape Browser or the localised equivalent. During the installation, a US ZIP code is requested to allow Netscape to provide local weather information (more on that later). This UK-based correspondent entered the only US ZIP code he knows, 90210. The Netscape logo doubles as a throbber (the animation is identical to the one in Netscape 7.2). The standard Windows title bar is not used; Netscape Browser rolls its own with XUL. The Back, Forward, Reload and Stop buttons have no surprises. The Home button has a little menu attached. The first menu item is just the home page URL; if a user has multiple home pages (as is the default) they are all listed separately, allowing just a single home page to be opened. The menu continues with a separator and four additional items: 'Set Home with Current Page', 'Set Home with Bookmark...', 'Set Home with Blank Page' and 'Set Home Group with Current tabs'. We can tell that they're trying to make it easier for users to change their home pages but they've just cluttered the interface with options that will probably be hit accidentally more often than intentionally. The final item on the left side of the Navigation Toolbar is the venerable Location bar, which works just like in Firefox. The Go button is integrated and cannot be detached, which is a fairly good idea. Sadly, it's one of the few good design decisions in Netscape Browser. Unusually, the menu bar is right-aligned and grouped with the window controls (a further reminder that Netscape has rejected the standard Windows title bar and decorations). The actual menu items are largely the same as Firefox's, except that there's no context menus for the items in the Bookmarks menu. The left-most button controls popup blocking. It has the caption 'Allowed' if popups are allowed and 'Blocked' if they're blocked. The button is a simple toggle between the two modes but it also comes with a menu, containing options such as, 'Display Number of Pop-ups Blocked' (turns the button into a counter) and 'Play sound when Pop-up is Blocked' (irritatingly, this sound is the same as the one used to indicate that a Buddy has signed off in AOL Instant Messenger). You can also bring up a list of sites that have had popups blocked (useless as you cannot do anything with it) and go into the Options to fine-tune the pop-up blocking for the current site. The next button is for the Passcard Manager, which is the new name for the Password Manager. If you're on a site for which you have a saved login (or 'Passcard' as it's called now), hitting the button fills in the relevant information (unlike in Firefox and earlier Netscape incarnations, it's not filled in automatically by default). The associated menu also lets you choose which named Passcard to use (only appropriate if you have multiple logins for a site, each of which you are prompted to name when saving), enter a login and submit the form straight away, and edit the stored Passcards for the current site. Overall, we find the Passcard Manager to be far inferior to the simplicity of Firefox's Password Manager, which automatically fills in login forms when there's just one login for a site and uses an autocomplete mechanism when there's several. Netscape Browser, on the other hand, requires the user to explicitly do something to get the feature to work and adds to the confusion by requiring logins to be named. 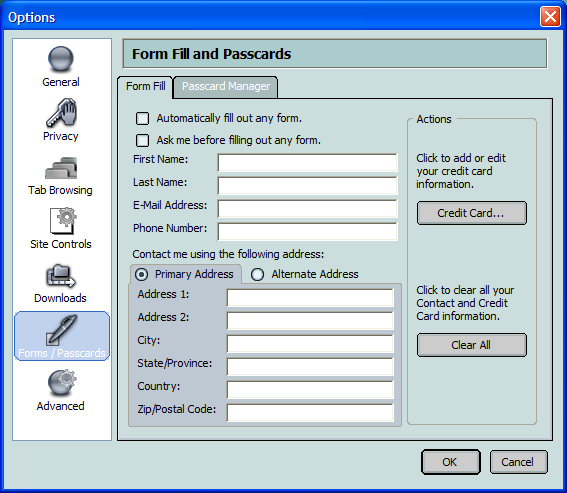 The Form Fill button is used for rapidly filling out forms. It's separate from the standard Firefox feature that autocompletes form fields based on saved data (this feature is still present in Netscape Browser). With Form Fill, you can input frequently requested personal information (name, address, email etc.) into the Options dialogue and then hit the Form Fill button to have it entered into a Web page form. Fields which are filled in using this feature are highlighted in yellow. It's very similar to the AutoFill feature of the Google Toolbar and, in our very limited testing, works rather well. Next up is a button for clearing the history. Its menu also has items for deleting other private data, such as stored cookies and the cache. In addition, there's a menu item for 'Anonymous Mode', which, despite its name, is more of a preference. It simply tells Netscape to delete all private data when exiting ( a useful and oft-requested feature). Strangely, this menu item is not a toggle and users must visit the Options dialogue to turn it off. Finally, there's the Print button, which isn't terribly exiciting. The weather forecast is localised based on the ZIP code supplied during installation. Clicking the weather button takes you to a fuller forecast, while the menu lets you see national temperatures and update your location. It's actually quite a useful and unobtrusive feature. Which is more than can be said for the News Ticker, the next item along. It cycles through ten or so headlines, spending a few seconds on each one. If a headline doesn't fit, it scrolls. The movement is more than a little distracting. Clicking on the ticker reveals a menu with the ten headlines in it, each of which links to a full story. There's also a 'Select feed' submenu, which lets you choose what sort of news you see. The options are Headlines, Money, Sports, Entertainment and, curiously, Slashdot. It doesn't appear to be possible to add your own feed. Next up is the Search bar, which is identical to Firefox's, except that Netscape Search is the only search engine. The drop-down menu contains previous searches and a clear item that doesn't actually work. Yes, there's enough buttons to warrant tabs. The Navigational tab contains more than just navigational controls, with buttons for clipboard operations and the like also living here. The Functional tab is home to the buttons on the right-hand side of the Navigation Toolbar, all of which are enabled by default. The Personal tab is anything but; it's filled with buttons to take you to various America Online properites (inStore shopping, Moviefone cinema listings, MapQuest etc.). There's a button for AOL Instant Messenger that just goes to AIM.com, despite the help suggesting that there's a built-in client. The Headline tab has some of sort of Stock Ticker and is where the two News Tickers go if you remove them. After you close the customisation dialogue, there's a noticeable delay while everything updates. The first icon opens My Sidebar, which seems to be unchanged from Netscape 7. The next button opens a new tab, which by default opens to the right of the current tab and duplicates its content. The attached menu also lets you open a blank tab or a tab with your home page, and has an item to jump to the Tab Browsing panel in Options. The button at the far right opens a menu listing all the tabs in the current window. The actual tabs themselves have controls on them too: background tabs just have a close button, while the active tab has a Site Controls icon and a close button with a menu. If the sight of the 'Display like Internet Explorer' option made you break out in a cold sweat, please be seated. 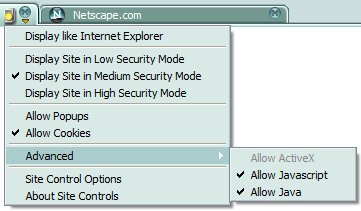 It's true: this option makes Netscape use IE's Trident rendering engine for the current site. Here's how Netscape describe it in their help file: "Remember the old debate over which is the best browser? Tired of having to use different browsers to surf the web? Well, now the debate is over: Netscape Browser includes two separate layout engines, so you can choose to view a web site like Netscape Browser or like Internet Explorer." They may as well have said, "That's it, we surrender." 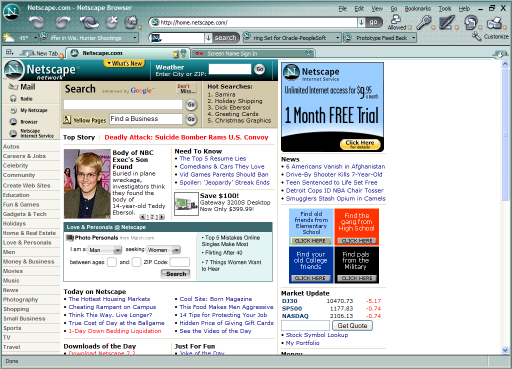 With 'Display like Internet Explorer' enabled, Netscape uses IE to render pages, sends the user-agent of your installed version of IE to websites and makes Microsoft representatives say, "We are very pleased to see a vibrant ecosystem involving hundreds of partners and independent software vendors continue to develop on the IE platform." 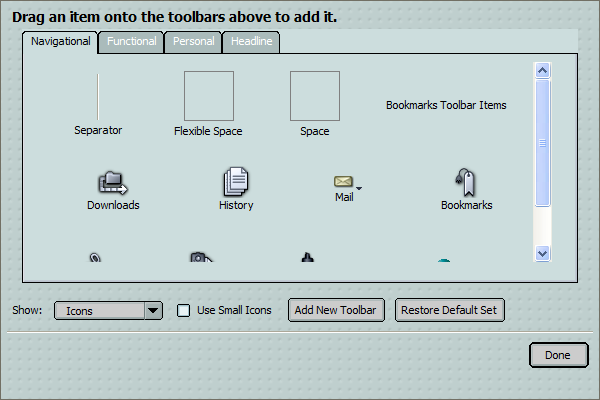 The option is omnipresent in Netscape's context menus, always the first item in the content area. 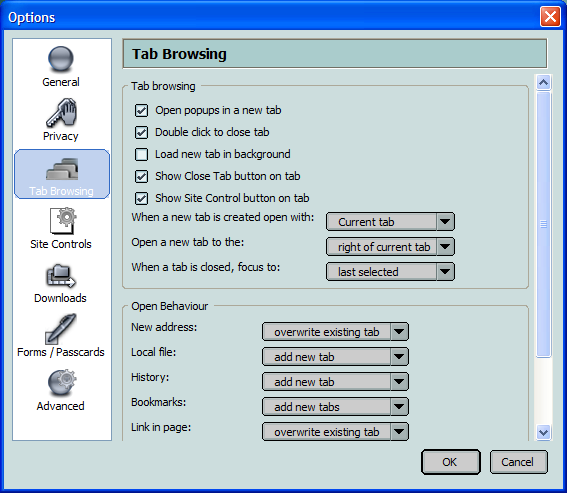 Bet you never knew there were so many ways to close a tab, did you? The first two items are useful (you'll know them as 'Close Tab' and 'Close Other Tabs' from Firefox), the next two ('Close all to the left' and 'Close all to the right') look less so. 'Close blank' (closes all blank tabs) could come in handy but possibly not often enough to warrant a menu item. The 'Close all from same site' and 'Close all except from same site' items may be useful to some. 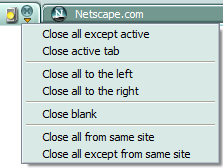 Overall, however, we think Netscape have made closing tabs far too complicated. It looks like Netscape may have seen bug 108941 and not got the joke. There are far too many obscure options here. Granted, some, like the 'Open popups in a new tab' option (which was yanked from Firefox just before 1.0), may be useful, but others, such as the preference for specifying where the focus should move to when a tab is closed, have no place in a browser for mortals. We suspect Netscape hope they can please everybody with these options but in reality they're likely to satisfy a handful of geeks, confuse a large number of others and have no effect on the majority who will never touch any of these options and just use the defaults. The list of configured sites in a fresh install is interesting. The first two, Default and Local Files, aren't really sites at all: Default contains the settings applied to sites you haven't visited yet and Local Files is for files on your own computer (interestingly, this uses the IE engine by default, possibly to allow CD-ROMs that rely on Internet Explorer to work). The first real site is netscape.com, configured allow popup windows, followed by spui.dublin.mercurial.ca, which seems to be where the News Tickers get their data from. The final site is microsoft.com, set to a Low Security Mode, presumably so that Windows Update works (and it does, we've tried). These options are for use with the Form Fill feature described earlier. You tap in your details here and they can then be inserted into any appropriate form with relative ease. Credit card details can also be entered and a password set up to protect them. 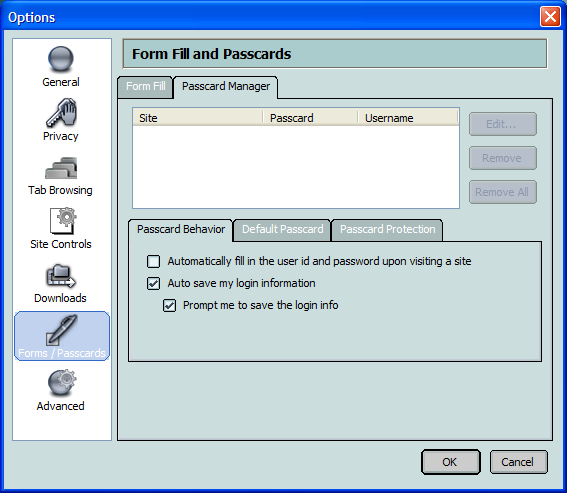 Users can select individual Passcards (a Passcard, as you will recall, is a single login for a particular site) and then edit or remove the data. You might notice that there is no equivalent of the Password Manager's 'Passwords Never Saved' list: this is because there is no such functionality in the Passcard Manager; if you never want to save a login for a particular site, you have to reject the offer to store it every time. Another reason why Netscape should have stayed with the perfectly adequate (and frankly superior) Firefox Password Manager. The Default Passcard tab lets you enter a default username and password (what for, we're not sure) and the Passcard Protection tab lets you set a master password and choose how often you want to be prompted for it. The Advanced tab is much the same as in Firefox 0.9.3. And that concludes our brief tour of Netscape Browser. With this prototype, Netscape have taken the lean and mean Firefox and created a browser that's... just not as good. They've added far too much clutter (the Tab Browsing panel in Options should go straight to the Interface Hall of Shame) and features such as the Passcard Manager are less streamlined and more confusing than their standard Firefox equivalents. Site Controls is an interesting idea but most users are simply not going to want to fiddle around with per-site settings when they could be doing useful browsing. The idea of Security Modes is laughable: Netscape Browser should always be secure. The decision to offer Internet Explorer's Trident as an alternative rendering engine, while pragmatic, is an insult to the heritage of Netscape and may set the cause of standards evangelism back years. There is some promise though. Form Fill looks genuinely worthwhile and the weather forecast feature is both useful and discreet. The News Ticker could also be beneficial to both Netscape's users and its business interests, were it not so annoying and were there not so many of them (who needs two news tickers anyway?). Overall, the Netscape Browser Prototype is a poorly designed piece of software, though one that is built on a solid foundation and has some interesting ideas. So who's behind this release? As we all know, there are no software engineers employed by Netscape any more, so the development must have been outsourced. With a little digging around, it becomes apparent that a Canadian outfit called Mercurial Communications are responsible. Their client list includes a certain Netscape of Columbus, Ohio (apart from the soon-to-be-sold-to-Red-Hat server division, Netscape no longer has any presence in Mountain View). The credits button shows a scroller similar to the Firefox one, except that all the names appear to be employees of Mercurial. CEO Chris Coldwell is apparently responsible for 'Architecture and Inspiration', whatever that means. The famous about:mozilla Easter egg appears to have been removed.